Each day, the body is exposed to a lot of mental and physical stress. At night, it’s important for you to be comfortable in the bed that you’re sleeping in to promote the body’s renewal, growth and recovery. A good night’s sleep will definitely encourage healing and revitalization. For these reasons, you should not be hasty in picking out a mattress. Your decision should be based on your needs and preferences, and not on price or popularity. There are so many different kinds of mattresses around, including coil or innerspring, air and foam. But you should be careful when selecting mattresses for you and your family because many items contain toxic substances. PBDEs or polybrominated diphenyl ethers are commonly used to treat mattresses so that these become more fire resistant. Then, there are also others that contain carcinogenic elements. Because of people’s awareness regarding such dangers, more are opting for organic or environmentally friendly types as these are safer and with fewer detrimental impacts on the world. Going organic is a good idea because this will ensure that you won’t be spending the night sleeping on a mattress that’s full of toxic elements. You can readily inhale these elements as you sleep, which leaves you vulnerable to the harmful substances that are on or inside a mattress. If you go for an all natural latex mattress, you’re being eco-friendly because latex, in this case, is made from the sap or juice of the rubber tree. The sap is harvested without cutting or harming rubber trees, and this further means that sources are sustainable. Sustainability is a huge issue because if there are sustainable resources, this means that such sources can be used over and over again without severely harming the environment and without overly depleting natural resources. Organic mattresses can also be made from foam, as well as cotton and wool. There are also hemp mattresses, which are actually pretty firm and durable. Hemp naturally prevents mold formation as well. Another option, which is very suitable for people with allergies, is a mattress made from bamboo. In addition to sustainability, you should also ask around or get information about what sort of treatments have been used on mattresses to avoid getting an item that would harm your health. There are also eco-friendly innerspring mattresses. Also known as coil mattresses, innerspring mattresses provide great support and comfort. 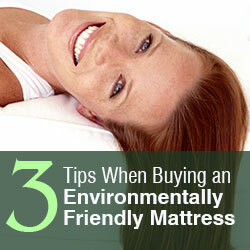 If you want to go green, choose mattresses with inner coils made from recycled steel. Used steel is as good as new steel because this material does not deteriorate quickly. Sometimes, you may also be buying a bed frame together with a mattress. If this is the case, inquire about the materials used on the frame. Ask if metal frames are made from recycled metal or steel. In case of wood frames, make sure that wood comes from sustainable sources and that this was harvested following environmental regulations. Claire Thorpe is a freelance writer. She contributes to several home improvement websites, and she also blogs about interior decoration, home management, and furniture. She also writes reviews about many kinds of products, such as eco friendly mattress Portland.